At our 2012 Latour Lunch, M. Engerer (president of Ch Latour) spotted this one straight away and subsequently declared it one of the best bottles he had ever drunk. The ’64 was arguably the surprise package of the day with perhaps limited expectations placed on it, considering the relatively humble vintage. In the event it was a perfectly graceful, rather aristocratic old lady with softness and concentration, sweet fruit and warm earth, all wrapped up in a delicate velvety glove. A great wine. 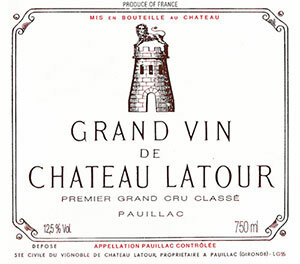 In 1964, as in 1966 and 1967, Latour was the best wine in the Medoc. The 1964 is drinking beautifully now, but it should hold for at least another decade. The bouquet is powerful, spicy, and filled with aromas of minerals, black fruits, and licorice. Rich, round, supple, generous flavors show excellent concentration. Soft tannins and a silky, rich, very long finish make this a sumptuous, even opulent Latour. Anticipated maturity: Now-2005. Last tasted, 5/91.